A strong start by the Bann pack was undermined by poor handling which too often turned possession over to CIYMS. Midway through the first half the home side took full advantage to run in an unconverted try for a 5-0 lead which hardly reflected the balance of play. Bann continued to dominate up front with some great breaks by Neal Cochrane, Paul Cairns, Stuart Marshall and Adam Kelly. A penalty opportunity was missed and despite the forwards’ good work Bann continued to waste chances through poor kicking or sloppy handling. CI capitalised on these mistakes and ineffectual tackling to run in two more tries before the break for a 19-0 lead. The obvious tactic would have been for Bann to keep the play tight, using their superior forwards to control the game. 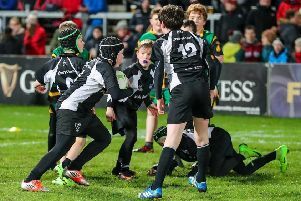 But instead they continued to try to run the ball against a speedy CI backline which snapped up enough loose ball to run in three more tries soon after the break for a 36-0 lead. Bann had not given up however and they rolled a maul over the opposition line to reduce the deficit to 36-7. Keeping the ball tight they again worked their way into the CI “22” and Cairns demonstrated great ‘soft hands’ to put Calum Boland in for a try under the posts, leaving a more respectable final scoreline. Leaving aside the missed tackles and poor decision-making, Bann showed some good form. The front five of Barney McKevitt, Gareth Briggs, Thomas Thornton, Cairns and Marshall dominated the scrums and lineouts while the back row of Kelly, Cochrane and Thomas Magennis really put themselves about the park. It was also great to see Chris Berry back in action. The Fourths next League game is against Dungannon this midweek under the Rifle Park lights.